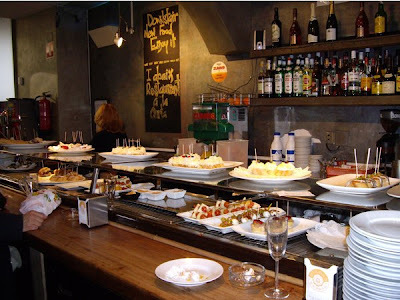 I have visited the popular tapas restaurant Bilbao Berria in Barcelona a number of times these last years, and always decided to revisit, as in June 2009. After this last visit, I found that much of the previous magic had disappeared. The once charming chaos felt distressing and claustrophobic, and it was hard to get the waiters' attention. 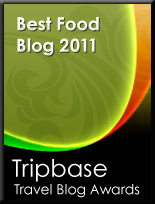 The food, however, was still to die for, and worth a visit if you stay in the Catalan capital, but do not expect good service! Bilbao Berria is located at Placa Nova in the heart of the city, just by the magnificent cathedral and the Barri Gothic and a short walk away from Placa Catalunya and Las Ramblas. As Bilbao Berria is a self-service restaurant where you are left to fend for yourself. No menu necessary, as you just walk up to the counter and pick what you want. You pay according to the length of the wooden stick pinned to your food (two sizes). The only thing requiring service is to order drinks and to pay, both equally difficult in the noisy restaurant. This time I really had to really work to get the waiters attention, much harder than during previous visits to this restaurant. Bilbao Berria had recently been renovated to a more contemporary design, but it was as overcrowded as earlier. We felt rather pressed for space as we watched the commotion in the restaurant. As popularity for this restaurant had soared, much of the charm had disappeared. 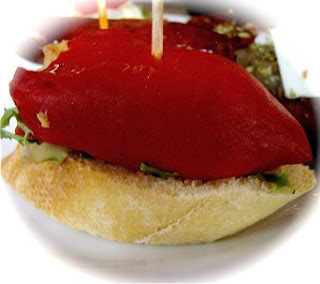 You definitely go til Bilbao Berria to enjoy Pintxos, Basque style tapas served on thinly sliced white loaf. You simply walk to the counter and take what you like, and pay per stick left on your plate. Here are the tapas we chose in June. Tarte with mayonnaise based salad. 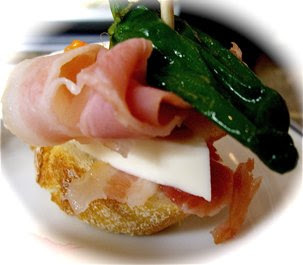 Quite a few pintxos varieties have mayonnaise based salads based either on boiled ham or prawns or tuna. This delicate tarte is made with eggs, garnished with a large black olive and a slice of baked peppers. 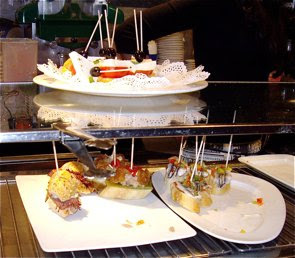 This is a variation of a traditional pintxo, served on a pastry shell, whereas most of them are served on a slice of bread. 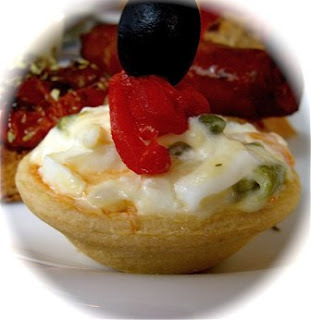 This pintxo provides a delicious contrast of different tastes, mildness from the rich egg salad, sweet aromas of the baked red pepper, and the strong salty olive. Another favourite, that I always choose when I visit Bilbao Berria. One large grilled pepper stuffed with a creamy mayonnaise based tuna salad. The stuffed pepper is pinned into one slice of baguette. This is a tapa that I have made with a little twist, at the latest at my best friend Ketil Zahl's 50th anniversary. This hot pintxo is another favourite. 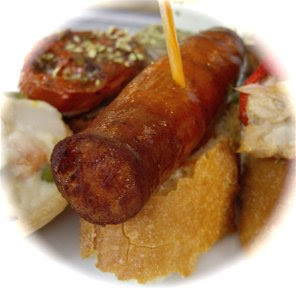 Spaniards are experts on how to prepare fresh, cured and/or smoked sausages. There are a large number of sausages that vary in tastes from mild aromatic to strongly spiced. This chorizo found among the hot pintxos is hot in more sense of the word than one, as it is packed with spices and garlic and served on a crisp slice of bread. A pintxo tower with bacon, cheese and a hot green chili. These fried, lightly salted green chilis are most often by themselves whole with seeds. 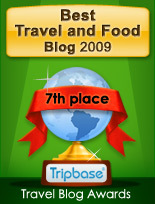 Norway are one of the largest producers of farmed salmon in the world. 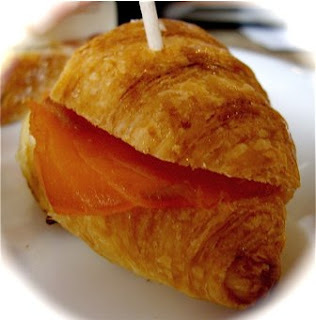 As I chose this small croissant I wondered whether the sliced salmon was Norwegian or Scottish. Much simpler than the other bite sized foods under offer on the counter at Bilbao Berria, but equally delicious. The wines are served in small glasses. I chose a glass of chilled white wine, perfect for a hot summer's day. It was a medium dry, light, and fruity white wine. Good and very inexpensive. Location and food is as excellent as earlier. 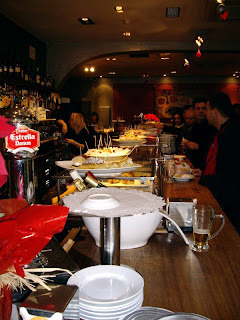 Service and space worse than earlier, as Bilbao Berria has gained popularity. A stress-full and noisy experience. I wonder whether I will return for another meal, or try elsewhere. I just went there and the server was straight up mean to us. Screw this place. Yep, the food was good. But I've never been so insulted at a restaurant ever.